I see a gypsy swirling her skirt here! Kathryn Scott Design Studio is a New York based interior architecture design firm. A self-taught designer and former painter Kathryn Scott’s work combines a mixture of styles. Reflecting client’s tastes and lifestyle she goes on to create a portrait which is unique, and timeless. What emerge as end result are contemporary minimal and comfortable style spaces with few surprises. 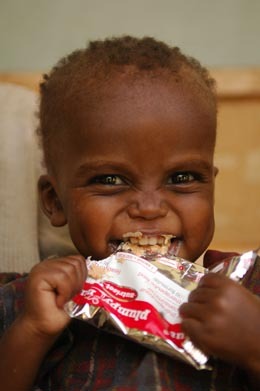 So that International Medical Corps can help millions of malnourished children to smile and shine like this one! Vote doesn’t cost you a thing! Vote Today as time is running out. You can vote till 13th of October – for next three days. Vote For ‘Feeding 1 million children daily’ project by Akshaya Patra Foundation. While watching TV or reading a book, ‘a strange thing happens’ to me. I am comfortably sitting on a chair or sofa and then I end up sitting on the floor! How this happens; go unnoticed! Perhaps between the sofa and floor rests some curling up, stretching and bending activities!! I do not know with how many of you ‘this strange thing happens’ but to my kind of people these furniture pieces are remarkably comfortable and suitable! I wonder why many more such designs are not there? This furniture responds to variations in sitting habits of different cultures and situations. So the western chaise lounge is extended to a carpet of eastern craftsmanship. Luxury of sitting in countless ways! Indeed! Feeling angry at how easily actors and politicians in India kill rare and protected species and get away scot-free or lightly! Don’t want to say more as this creation of artist Shampa Shah says everything too well! We can pledge support in various ways ? These are few stunning pieces made out of ostrich egg shell. The egg shell is collected after the ostrich chick hatches. Artisans are from South Africa. Supporting artists and creating meaningful employment is an integral part of Jacaranda Style’s mission. Dori Rootenberg is the founder and sole curator of the Jacaranda Style collection. A portion of every sale is donated to the Ethembeni School for disabled children in South Africa. Thousands of ostrich egg shell shards are used to create this stunning frame. No two frames come out same as handwork and natural materials are used in creation. A part of an ostrich egg – hand carved, polished and painted with gold metallic colour.